Join an all star group of deep-sea scientists who are currently on the R/V Atlantis investigating hydrothermal vents on the East Pacific Rise. They're using Alvin, a three-person submersible, to collect samples and do experiments 2,500 meters down on the seafloor. Their goal is to provide deeper insight into the microbiology, geology, and mineralogy of these vents. During each event we'll watch as they launch Alvin from the ship and into the ocean before heading into the lab to see what the researchers have been up to. Dr. Amy Gartman is a Research Oceanographer at the U.S. Geological Survey Pacific Coastal and Marine Science Center, where she has studied marine minerals since 2015. She's been on research cruises across the Pacific and Atlantic oceans, using human-occupied and robotic vehicles to explore the seafloor. Dr. John Jamieson is a Professor and Canada Research Chair in Marine Geology at Memorial University of Newfoundland. He studies seafloor hydrothermal systems, seafloor exploration, and marine mineral resources. He has participated on 13 research cruises in the Pacific, Atlantic, and Arctic Oceans. Dr. Eoghan P. Reeves is an Associate Professor at the University of Bergen Department of Earth Science and the K.G. Jebsen Centre for Deep Sea Research. 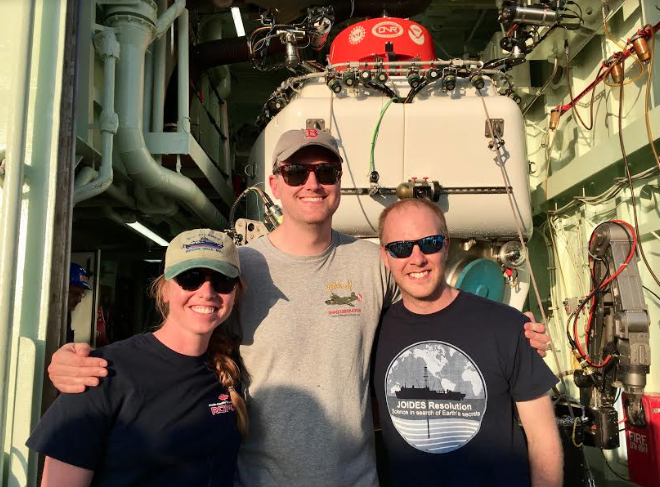 One of the goals of his research is to understand how hot fluids venting from the seafloor can feed chemosynthetic food chain around seafloor hydrothermal vents.